Originally, Moscow’s centre was known as the White City. The origins of this name are unknown, but a popular theory suggests that it came from the lime which coloured its buildings. Comprising the heart of Russia’s capital, it was surrounded by defensive walls dating from the sixteenth century. Fortified towers, known as gates, were spaced around these walls, and lend their names to many of the boulevards today. As the city grew, however, these fortifications began to lose their defensive significance. The eighteenth century saw particularly rapid growth, and the eighteenth and nineteenth centuries saw the White City’s walls demolished to be replaced by boulevards. 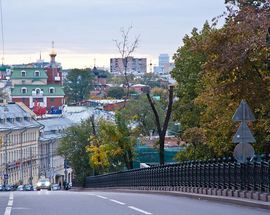 Some boulevards were built following 1812, when the four-day fire that ravaged Moscow is estimated to have destroyed three-quarters of the city’s buildings, which included parts of the city walls. Although this appears to have been largely accidental, the fire was started in the confusion accompanying Napoleon and the French army’s occupation of Moscow. As well as a slightly turbulent birth, the boulevards have been the site of political protest; the largest in recent years were the mass rallies following 2011’s state elections and the Occupy Abay camp in May 2012, which saw thousands of people attend. Their pleasant aspect, however, gives little sense of this historical unease. Trees sway green overhead, striking sculptures and monuments are to be seen at every corner, and the boulevards are altogether an appealing place to spend an afternoon – without even touching on the many restaurants, cafés and attractions which line their streets. 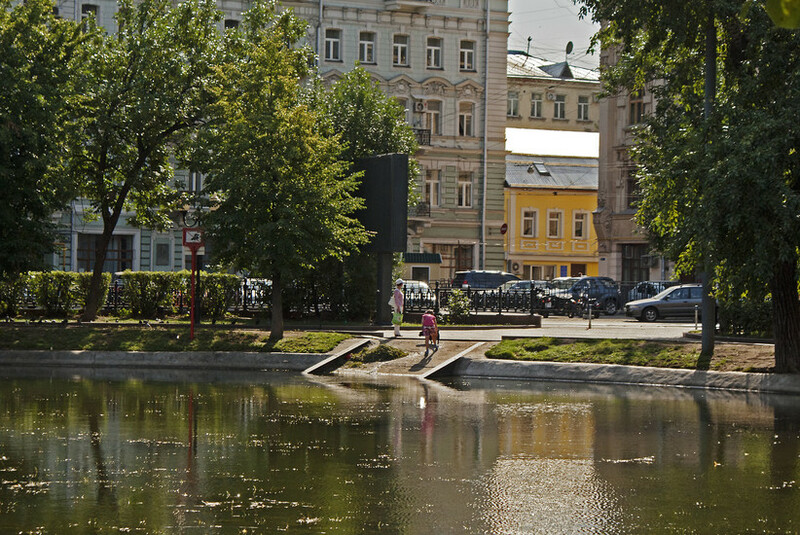 Taking an anti-clockwise path around the boulevards is to begin at Yauzsky Boulevard. Planted with linden trees and away from busy roads, this is the most secluded of all the boulevards, but no less beautiful for it! It was constructed in 1824, and its quiet neighbourhood makes for a relaxing stroll. The next boulevard is Pokrovsky Boulevard. Much more lively, this is the youngest member of the Boulevard Ring. 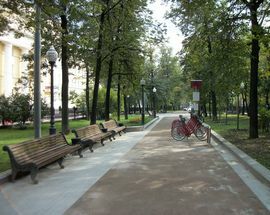 Previously the site of a barracks, space was made for a boulevard in 1954 and Pokrovsky joined the ring. The barracks still remain, and can be seen from the boulevard; although they, like many other buildings, were destroyed in the fire of 1812, they were reconstructed shortly afterwards. 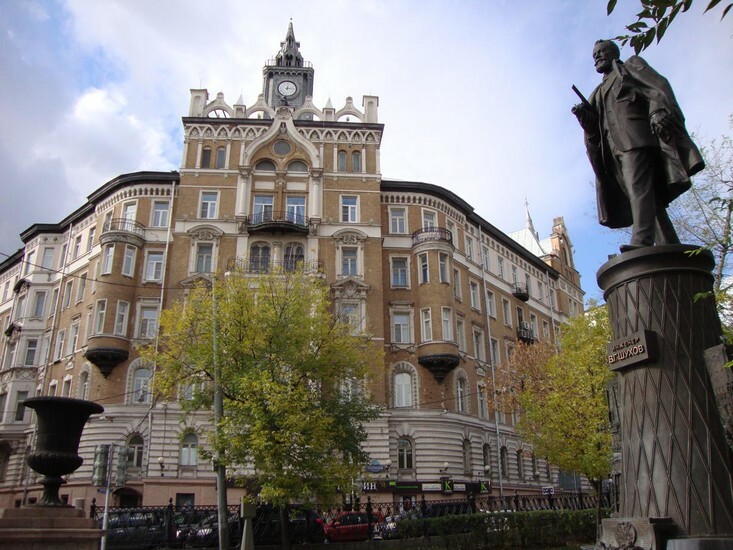 Here can also be seen the Iranian embassy – in the 1960s façade of number 7 – and a monument to N. G. Chernyshevsky, a Russian philosopher who was a proponent of rational egoism and new humanism, and spent over 20 years of his life in penal servitude for his ideas. A little more cheerily, Pokrovsky Boulevard is home to the cosy and hip Microbe bar (at no. 6/20) which will allow you to drown any philosophical sorrows in style. It also has occasional live music and serves food, including vegetarian options. Chistoprudny Boulevard is next. This name means “clean ponds”, and has rather unsavoury origins; in 1703, the land was bought by one A. D. Menshikov, who wished to create the pleasant boulevard we see today. However, there was one slight problem – the water was entirely contaminated with trade waste from the longstanding butchers’ businesses centred around the adjacent street. Menshikov commissioned a dramatic clean-up operation, and henceforth the area was known as “clean ponds”. It is now a home to ducks and swans, and a popular green space. In the winter the frozen pond is used as a skating rink. 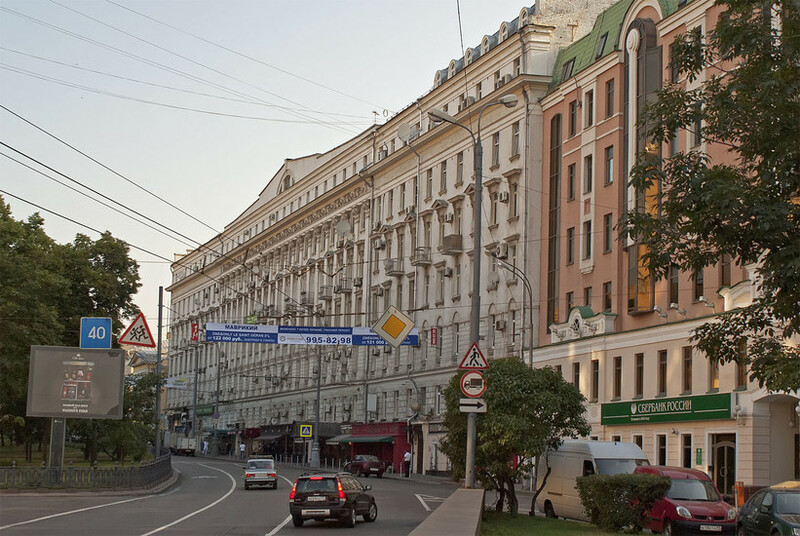 Many of Moscow’s aristocracy lived in and around this area, and their mansions line the boulevard today. Particularly notable is number 14, a stunning example of Moscow Art Nouveau, built in 1908-1909 and featuring mythical creatures sprawled over almost the whole of its façade. 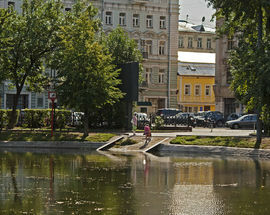 The next boulevard encountered is Sretensky. At only 214 metres long, this is the shortest boulevard in the ring. However, good things come in small packages - - Number 6/1 was once described by the French architect Le Corbusier as the most beautiful building in Moscow, and there are many reconstructed old buildings in this area. Historically many craftspeople lived here, as it was a home for market and trade. Today it’s a popular location for tourists to stay, and boasts perhaps the largest number of hotels of any of the boulevards. Becoming a little livelier as we move into the centre proper, Rozhdestvensky Boulevard is next. 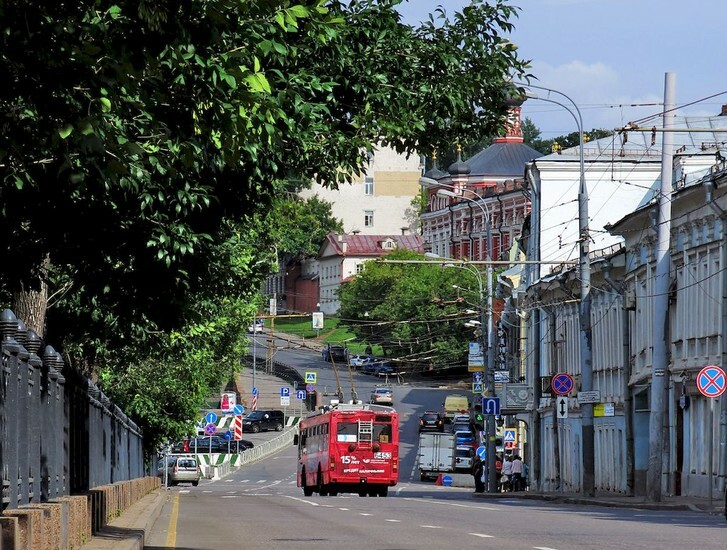 It is named after the ancient Rozhdestvensky convent at the corner of the boulevard; this translates to Nativity of the Blessed Virgin, not “Christmas” as this boulevard is often incorrectly translated to. Although many fi res have destroyed the ancient buildings that used to stand in this area, some may still be seen – particularly notable is number 25, the Church of the Assumption of the Blessed Virgin in Printers, which was built in 1695. This boulevard was the site of a catastrophic crush in 1953, and also the famous story of the “unknown hero”. Publicised by the news story run in Pravda, and immortalised in a poem by Samuel Marshak within twelve months, in 1936 there was a fi re in number 20 from an exploded kerosene stove, and 24-year old M. Anikeyev was trapped inside on the fourth fl oor. Seeing this, a young man jumped from a nearby tram, shinned up the drainpipe and eff ected a dramatic rescue. On handing Anikeyev to the care of the emergency services, the young man vanished into the crowd once more. Modern highlights of Rozhdestvensky Boulevard are the stylish (and amusingly-named) [S]hell Yes!, a lovely little restaurant serving excellent seafood, and Rock’N’Roll, which with a bar, café and club will take you from morning to the small hours. Escaping south from the ring is Tsvetnoy Boulevard; this is where The Old Moscow Circus is located. Built in 1880 by former rider and gymnast Albert Salamonski, this is one of Russia’s oldest circuses and since its remodelling in the 1980s can accommodate up to 2000 spectators. Deathdefying performances and mind-bending talent make it well worth a visit. 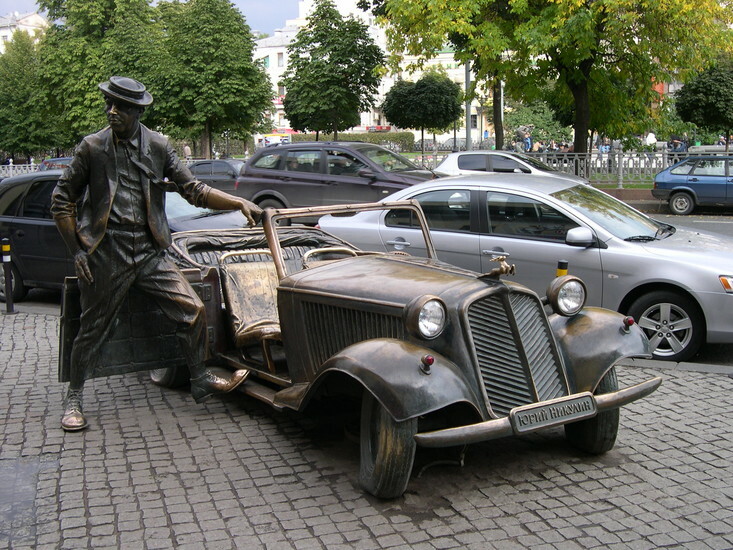 It’s easy to spot – just look out for the clown statues in the centre of the boulevard. The nearby Mad Cook serves excellent Italian-inspired food, and the Buddha Bar next door is popular with foreigners. 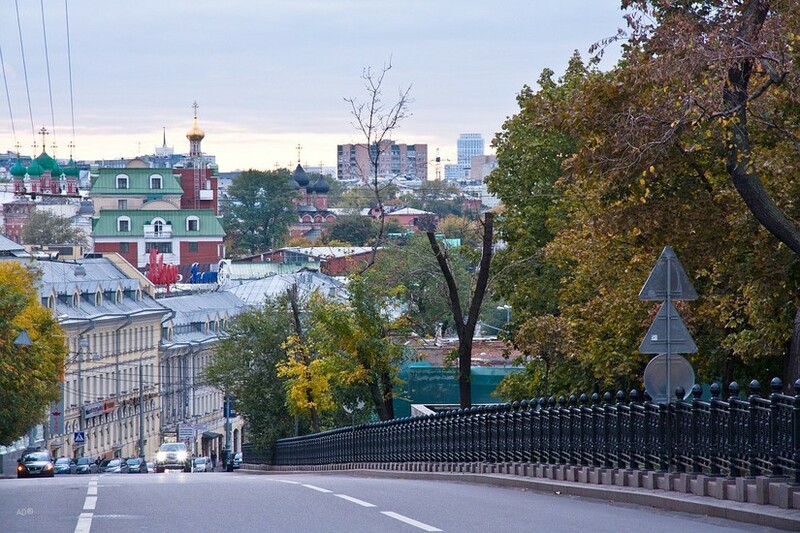 Petrovsky Boulevard, the next to be reached, was named after the Vysokopetrovsky monastery. It houses the theatre “School of Modern Play” at number 14/29, which was damaged by fi re in 2013. 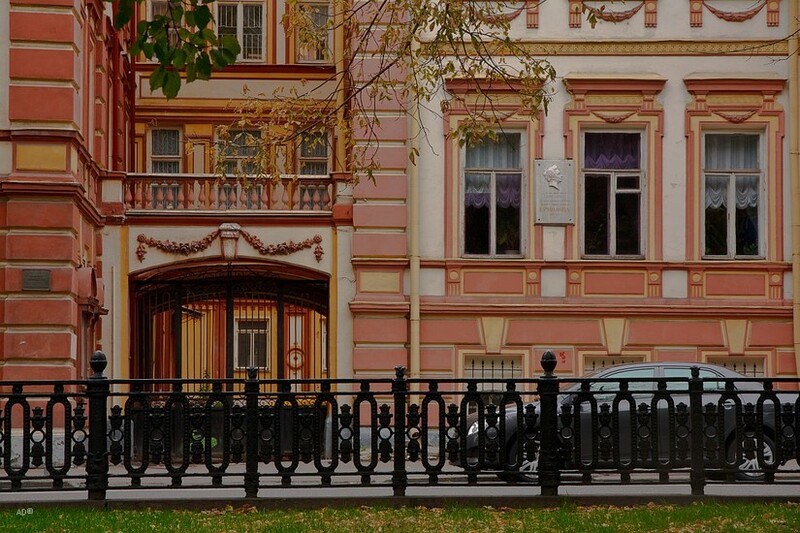 It also houses the famous restaurant Hermitage, which was popular with Moscow artists and intellectuals – composer Petr Tchaikovsky loved it so much that in 1877 he held his wedding at this venue. 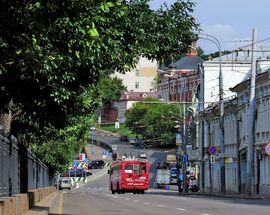 Petrovsky Boulevard runs into the “pipe” area – the region where a hole in the wall allowed the 17th century White City to take water from the Neglinka River. Named Trubnaya Square, this was the site of Moscow’s fi rst bird market in the 1840s, which began a tradition of releasing doves on Annunciation Day each year. 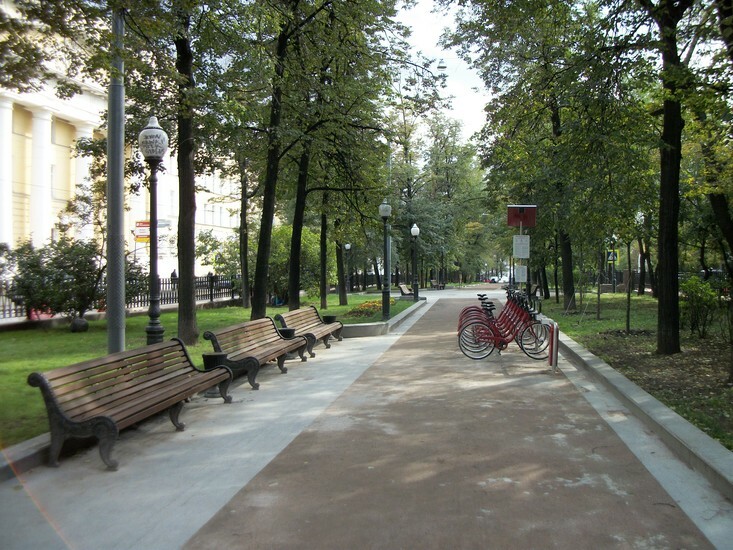 Strastnoy Boulevard was turned into a boulevard in 1872 by E. A. Naryshkina, the local landowner. Before this, it was the eighteenth-century Hay area, where in the day hay was traded and in the nights was the site of many robberies and dodgy dealings. 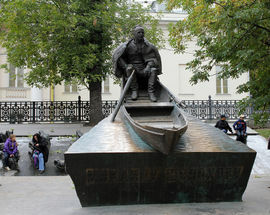 It is the widest boulevard in the ring, and runs onto Pushkin Square, where a monument to the writer may be seen. 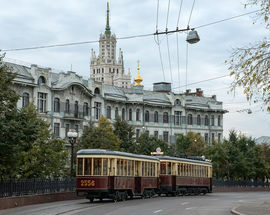 At number 5 is located the fi rst girls’ grammar school in Moscow, built in 1874-1878. In the early twentieth century the Museum for Visual Aids in the Natural Sciences was added. It is now occupied by the Federal Agency for Press and Mass Communications. Perhaps most interesting for the non-Russian specialist is the fact that composer Sergei Rachmaninoff lived and worked here in the period 1905 to 1917. Continuing this cultural theme, the Moscow University Press buildings were erected in 1816-1817, with its printing press gained in 1811. 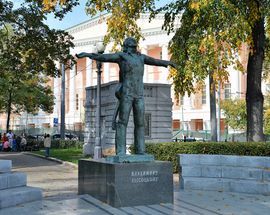 There are monuments to sculptors Oleg Komov, Andrei Kovalchuck, Raspopov, statesman F. N. Petrov and the famous singer-songwriter and poet V.Vysotsky to be found on this boulevard. St. Alexander Nevsky church is worth a look. Built in 1836 and rebuilt in 1872-1876, like many churches in the Soviet era it spent some time in use as first a metal workshop and then a boiler room. It has now returned to being a place of worship. If you lie Strastnoy Boulevard, there is a 1999 drama film of the same name set in and around the area, and worth a watch for period drama enthusiasts. 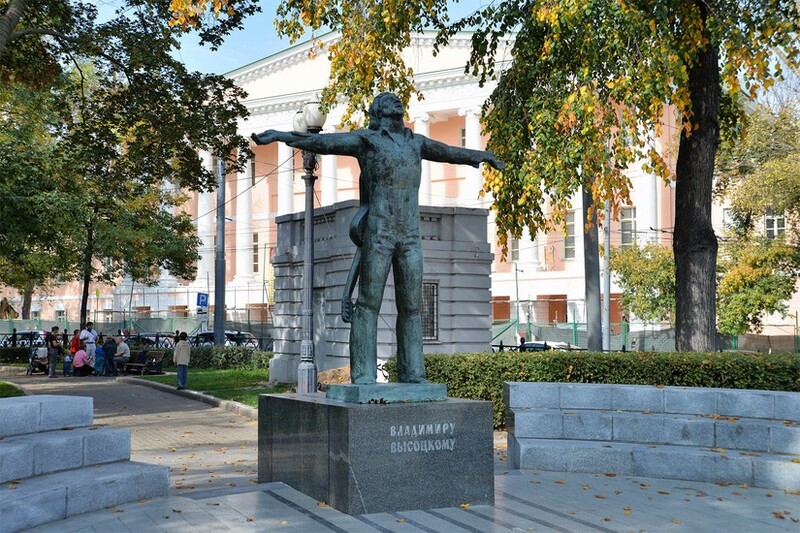 Tverskoy Boulevard is another deeply historical location. At number 2/7 is the famous building Romanovka. Although this had to be restored after 1812, much of the design remained unchanged from a century before. It housed students from the nearby Moscow Conservatory, and from the Moscow School of Painting, Sculpture and Architecture. In the 1890s, a hall for concerts and a music room were added, and this part of the building is now in use as a theatre. It was here that Mayakovsky, then a student at the Moscow School of Painting, first gave poetry readings. At number 25 is the Gorky Literary Institute. 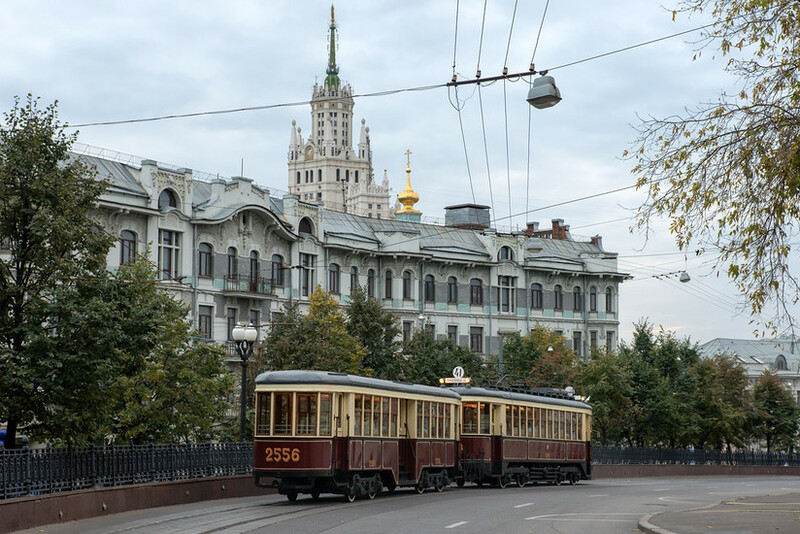 This was rebuilt in 1882, but its earlier incarnation was home to a glittering literary salon where during the 1840s and 1850s the greats of Russian literature at that time converged, including Nikolai Gogol, P. Chaadaev, N. Ogarev and E. Baratynsky. Although they tend to be slightly pricy, it’s worth eating at one of the restaurants on this boulevard for the experience. 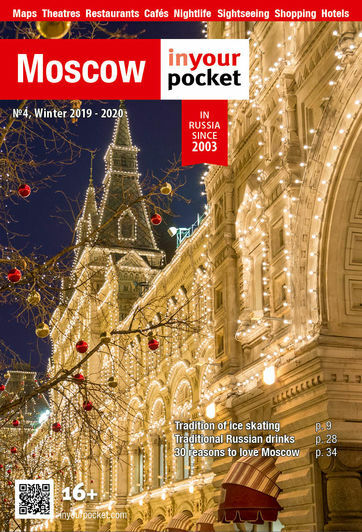 Café Pushkin is one of Moscow’s landmark restaurants, serving traditional Russian food in a gorgeous interior; particularly lovely is the Library hall, filled with gold-spined books. Turandot restaurant, located at number 26/3, is slightly less well-known but no less worth a visit; Asian-style food is served in a glittering, palatial interior with regular live music (mostly jazz), and the atmosphere is romantic. Continuing anti-clockwise, you will reach Nikitsky Boulevard. This was named after the long-standing convent which was located here. In the mid-1920s, the convent was closed and its buildings demolished in 1933. 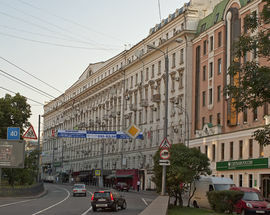 The boulevard underwent a brief name change between 1950 and 1994 to honour Russian military commander Alexander Suvorova. Number 7A is notable for being the building in which Nikolay Gogol died in 1852, which now houses the Municipal Library and a memorial museum to the writer. A monument was installed in the courtyard in 1959 and can be seen today. At number 6 is Nightingale House, where music rooms and a theatre were located. At number 8A/3 is the House of Journalists, a hub for pre-war writers and the site of a monument to fallen war correspondents. 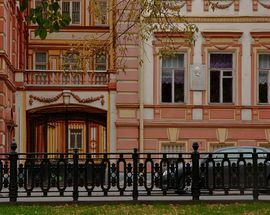 At number 12-12A is located the Museum of Oriental Art, worth visiting in its own right as a stunning example of Moscow Classicism. The final boulevard in the ring is Gogolevsky Boulevard. As the keen-eyed may spot, this is named after Nikolay Gogol, that giant of Russian literature. Previously known as Prechisetensky Boulevard, it was renamed to honour Gogol in 1924 as part of the celebrations for his 115th anniversary. The monument to the writer which dominates much of this boulevard was erected in 1952, although there was a previous monument here pre-revolution. 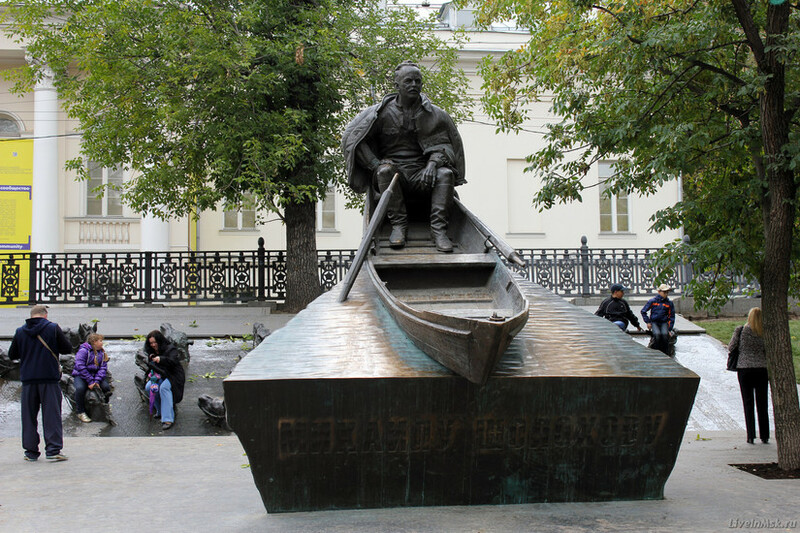 There are a number of striking sculptures and monuments further along the boulevard including a rather vertiginous one depicting the Nobel Prize-winning writer M. M. Sholokhov adrift in a boat surrounded by horses swimming up the rising waves. In summertime, photo and art exhibitions are often held here, and it is a popular location for couples to stroll. At number 10 is a building now occupied by the Russian Chess Association, but previously famous as the location for secret meetings held by the Decembrists, Russia’s first revolutionaries. Continue along after the boulevard ends and you will be brought back to the river and the gold domes of Christ the Saviour cathedral.